The Rainbow Generation Cricket Club of West Berbice on Wednesday last became the thirteenth Club in the area to receive assistance from the Rose Hall Town Youth & Sports Club and the Special Events Committee of the Berbice Cricket Board. 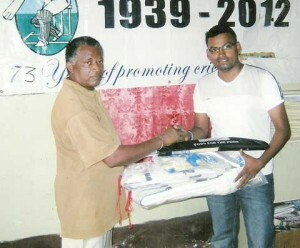 Mr. Shabeer Baksh (right) receives the donation on behalf of Rainbow Generation from RHTYSC/BCB President Keith Foster. The Club received a collection of cricket gear which included one bat, wicket-keeping gloves, pads, batting pads and a scorebook to assist them in their youth development programme. Secretary/CEO of the Rose Hall Town Youth & Sports Club and Chairman of the Special Events Committee Hilbert Foster informed that the Rainbow Generation Cricket Club is one of the most active clubs in Berbice and over the years has played in every tournament organised by the Berbice Board. He urged the club to continue to strive for excellence and to continue to invest in youths. Foster noted that the West Coast of Berbice was receiving special attention from the BCB this year after years of neglect from an in active West Berbice Cricket Association. Public Relations Officer of the Rainbow Generation Cricket Club Mr. Wayne Fraser expressed gratitude to both organisations for the assistance which was valued at $60,000. Fraser praised both entities for the roles they are playing in the development of cricket in the West Berbice area while pledging that his club would continue to play its part in producing new talent for the County at all levels. The Rose Hall Town Youth & Sports club and Berbice Cricket Board have expressed gratitude to Mr. Feroze Barakat and Food for the Poor (Guy) Inc for making the donation possible.